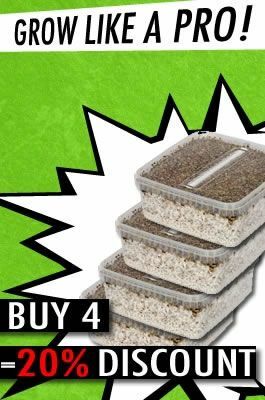 New magic mushroom growbox in stock: The Avalon Magic Plants PF Original magic mushrooms grow set is the easiest way to grow your own PF Original​ magic mushrooms at home. You only have to add some tap water once to the mushroom growbox. After 12 hours you let the access water flow out of the grow set and place it in the provided plastic filterbag. Place the filterbag in a bright spot (do not place in direct sunlight). After several weeks you will see your PF Original magic mushrooms grow to life!! With this magic mushroom grow set you can harvest up to 5 flushes of PF Original magic mushrooms! This mycelium grow set contains the mycelium of the Psilocybe cubensis 'PF Original' strain. The PF Original mycelium is colonized on a substrate of rye and perlite. The top layer is covered with vermiculite. The best place to store this PF Original magic mushroom grow set is your refrigerator (not your freezer!) if you do not want to start growing immediately after receiving this amazing grow set. Have fun growing your own PF Original shrooms! We do NOT ship this product to the following countries: UK/GB, Norway, USA, Australia, Lithuania, Latvia, Poland, Croatia (Hrvatska), Mauritius, Reunion Island, South Africa, Mexico, Japan, Canada, Brazil, Portugal, Estonia, Switzerland, New Zealand. PF Original Magic Mushroom Grow kit - 1200cc does not have any reviews yet. Share your experiences and post a review.